The children spoke over us at morning gathering, sharing about their spring break plans. We hadn't even sung hello when the room was filled with children sharing about "grammy," "super long car ride" and "blue airplanes." Realizing we were up against all odds, my Teaching Resident asked children to share about next week. First child exclaims, "I am going to Chicago with my Daddy. But Mommy is not going because they had a big fight this morning." We tread lightly. "Mommy and Daddy?" "Yes," she said, "and we are not going to Chicago. Only I am going. With Daddy." I said "It is sad when our family gets angry. I think probably everyone gets angry sometimes." In hopes of changing the conversation back to the original topic, I added "I hope you have fun on spring break." However, there was a chorus of voices, "My mommy gets angry, too! My Daddy gets angry!" The little girl concluded, "It's okay that they get angry. Mommy and Daddy said it's okay." It amazes me how much empathy children have for one another, and how much they share when they feel safe and loved. These children do - both at home and at school. I'm sure this little girl was witness to a fervent discussion this morning at her house. I am happy she felt that she could share this and I am delighted that all the children supported her. I moved on, "John, do you want to share about spring break?" "Yes! In spring break, I am going to sleep with my Mommy." Only in the three year old classroom are such words greeted with nods and understanding. Another sweetie shared, "On spring break, I am going on vacation. I am going to take a right, and I am going home." Thought this was really funny - she has been working a lot on maps in recent weeks, and she was definitely thinking this through in regard to her family trip. In this way, we went around the circle with children sharing what they knew about the week ahead. We will hear many more details when we return. Children share best when they have had the experience! 1. I work with colleagues who are excited about teaching. 2. I work with beginning teachers who have many questions about teaching, and this keeps my teaching real. 3. We respect and make time for reflection. 4. I am allowed to teach with an emergent curriculum - to create lessons around topics that excite my students. 5. There are many supportive families, ready to help in every way imaginable. 6. The student body is very diverse - racially, culturally, economically. 7. It is not only a preschool but an elementary and middle school, as well. 8. When I have a problem or a challenge, I have supportive colleagues who will share their insights. 9. School leaders are passionate about our school and its students, and they are approachable and responsive. 10. Spring break begins tomorrow! One last note - I hope that I continue this challenge through March 31st. Truth be told, I am headed to Scotland tomorrow and I am not at all sure that blogging will be something that happens. We shall see! I am bringing my laptop and I am sure my travel will fill me with ideas. I have loved writing for this challenge and reading so many amazing blogs by everyone else. Good luck, everyone! Friday is coming - and it is going to be great, this I know! My husband and I are flying to Scotland, spending spring break in Edinburgh with our son Bryce, who is there for a semester abroad. I am so so so excited! But, wow, there is so much "doing" between now and then. The good news is - today was the beginning of our special intersession at my school. Each day, instead of centers, the preschool and Pre-K classes are mixed up and divided up into small groups to pursue fun new activities. My intersession group this spring is called "Great Books in Great Places" - I and my colleague Ms. McNeil are walking the neighborhood with eight children and a bag of picture books, stopping to read in lots of fun new locations. Yes, it is a sweet way to teach! 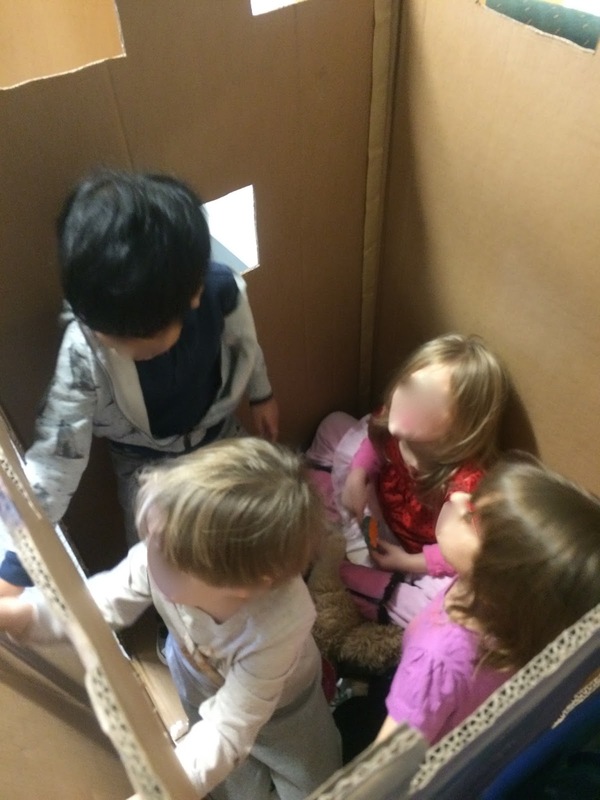 To introduce the intersession, we sat in our early childhood book nook and read Dr. Seuss' Ten Apples on Top. I explained that we would search for great places to read as we walked. Today, I brought a backpack filled with books about outdoors. We stepped out into the brisk air and walked up the street, up the hill, around the corner. We stopped to read whenever a child asked to stop.We had no sooner left the school when the children asked to sit on a concrete pad. We read The Listening Walk by Paul Showers, which led to us listening to and repeating all the sounds of the world around us - different birds, cars, the horn of a big truck, wind, laughter and voices, a bulldozer, hammering, and even a foam plate that the wind blew down the road. As we made our way down the road, we found a tree with a huge root system and the children thought that was a perfect place for another book (Birds, by Kevin Henkes). As we made it up the hill, there was an open field where some children sat while others collected sticks, all in earshot of the reading. Here, we read two books - one, a song, Inch by Inch: The Garden Song by David Mallett and, two, a book about friendship, Hot Day on Abbott Avenue by Karen English. We were just bending the corner of the road when we realized we had to get back to school in a very few minutes...we raced back! Yikes! That was the fastest hour of teaching ever...and we have so many unread books in the backpack still. Tomorrow we will walk and read again! I realized I was no longer tightly wound. I felt happy, carefree, lighter. Note to self - seek fresh air, walking, children, and books; a good mood will follow. I searched through my book collection for Eric Carle's The Grouchy Ladybug, which a colleague wanted to borrow. I found the book and set it down on the table for one moment, in the midst of our very busy centers time, while I helped a child find a tissue, mediated a squabble between a couple other preschoolers, tied a loose shoelace, and guided children at the writing center. But, wait, I set the book down on the writing table. Where was it? Where did it go? Didn't I put it right here? Around and around I looked, wondering if I imagined finding it, that perhaps it was on the shelf still? Then I saw them, three girls in the block area - reading the book in the midst of their pretend. 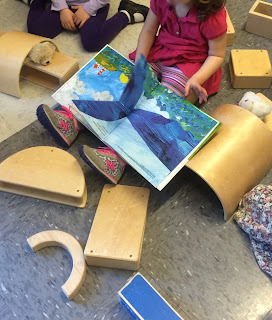 They were reading the book aloud, reading it together, helping each other to remember the words - and, I suppose, helping their stuffed animals get to sleep on their block beds. Adorable. Yes, preschoolers see themselves as readers! He appeared out of nowhere in the hallway with several of his middle-school classmates, on his way to class. She, the mom, had just dropped off her sweet little guy at my preschool classroom, to start his day. As she passed by, his shoulder knocked against hers, and then he fell to the floor - much to the merriment of his classmates. Mom was a little surprised, asked if he was okay, he nodded yes in the midst of the laughter, and everyone went on their way. The next morning, as Mom left my classroom after kissing her little guy goodbye, there he appeared again, tall, imposing, mischievous, surrounded by his middle-school friends. As Mom headed down the hall, he jabbed his shoulder into her shoulder, all the while sporting a big grin, and he threw himself down onto the floor, accompanied by more laughter from his friends. Mom hurried out of the school, on her way to work, but, unlike the day before, an uneasy feeling lingered. Was he doing this on purpose? Why this interaction two days in a row? After some thought, she contacted our principal, to share her concerns. She didn't know his name. She could only provide a physical description. The first I heard about any of the above was when the sixth grade boy was brought to my classroom by the principal mid-day, while the preschoolers were napping. The principal asked me if I had a little boy named Mark in my class. Yes, I do. Then she introduced John to me, the middle-schooler, and asked him to tell me why he was here. "I bumped into Mark's mother today and yesterday," he said in a quiet, uneven, chagrined voice. The principal continued, "John has written a note of apology. I think it is very important for him to meet Mark's Mom in person, to deliver the apology. What time does she pick up Mark?" And so it was agreed that John would return to apologize in person that afternoon, and give the note of apology. Oh these foolish, young boys. There is nothing more important than making your classmates laugh. The end of the day arrived, preschoolers were being dismissed to their families, and John appeared as planned. I introduced him to little Mark, saying "You'll be apologizing to this little guy's Mom." John was visibly contrite, looking a little nervous about what was yet to come. Into the classroom walks Mark's Mom and she sees John and me and her eyes grow wide. They step out into the hallway and John says his apology and gives her the note, and then he scoots away. Mark's Mom comes over to me, and whispers "How did he know to come here? I didn't want him to know who my child was. I have to tell you I am very scared of him. He said a very nice apology, but he did that mean shoving two days in a row. I think I'm being stalked. I spoke to the principal because I am scared." I was caught off-guard by this and simply patted her arm, assuringly, saying, "It's okay. He feels very badly about what he did." Mom and Mark went on their way. Does it matter that this middle-schooler is Black? Does it matter that this Mom is White? How are we to be in community together - diverse people, diverse ages, preschool, elementary, middle school? What does it mean for our community if adults are afraid of certain students? How do we move towards one another? I am the mother of three boys and any one of them could have done what John did when they were in middle-school. They did many, many foolish things. My boys are White. Did they get a free pass for silly, immature antics at this age? After several days of wondering and wrestling with this, I followed Mark's Mom out of the classroom after drop-off and opened up the conversation again. "Hey, I was just wondering, have you seen John again since his apology?" "No, actually, I haven't. Isn't that weird?" "Well, I hope you do see him soon. I think it would be great if you gave him a big hello and called him by name. 11 and 12 year old boys are so foolish sometimes; my own boys embarrassed me greatly at that age." Maybe a little preachy on my part...but, I wonder. How do we move towards one another? What if we dare to take one step closer? I turn on the classical music station as I drive and I am treated to a beautiful piano piece, just what I need. Breathe in, breathe out. Not the way I anticipated spending my Saturday morning. How long will my wait be at the minute clinic? This music is delightful. Steady your breathing, this is a small and inconvenient thing. Cloudy, yes, my left eye vision is definitely cloudy. Good thing I don’t have conjunctivitis (“pink eye”) in both eyes - how would I drive? I felt it as I walked into school yesterday, this dry, sandy feeling in my left eye. There has been so much pink eye in my class, in the school this year. But, I’ve never had pink eye, and, besides, I had no time for it. Denial set in. Yesterday, the long day of teaching would conclude with our Learning Showcase. There were many last minute details to attend to, and seeing a doctor on the fly was not on the list. This is the reality of teaching: let’s give you a busy, full day and then let’s throw even more at you while you are braced for the busy and full. I checked the mirror upon arrival at school – yikes, the left eye is a little red. I slip into the nurse’s office and she says there’s a good chance it is not pink eye, because it is only mildly red...though it could be I have caught it early, that the infection is just beginning. “Slip out to the minute clinic,” she says wisely. How to squeeze it on the list? No, denial is the best bet – there are children to teach, displays to put up, cleaning and decluttering that must happen in my classroom before the families arrive. At lunch, my eye is filmy and very red. Dang. This is real. I’ve avoided pink eye every year I have taught. I think I may have avoided it for 56 years. The jig was up. I was not to escape this experience. I call my doctor – it would mean a 45 minute drive from my school on one of the busiest days of the school year. How would I get out and back? I share my tale of woe and ask if they can simply send a prescription to my pharmacy. The receptionist laughed – “We cannot write prescriptions without seeing you.” Why not? Why not? Why not? The receptionist tells me that they don’t have any more appointments available today; she suggests I go to a minute clinic. Oh, brother! I decide to persevere, to make it through the day. I avoid close contact with everyone, I assure myself that my eyeglasses camouflage the infection, I check with my principal and colleagues to see if they are fine with this plan, and I push through the day. I must have washed my hands a hundred times. The Learning Showcase was fabulous. Our room looked great, the children’s projects were a huge hit with the families, and the children danced around the room, so happy to be visiting school in the evening. By the time I left school at 8pm, no minute clinics were open (and pink eye did not warrant an emergency room). This would be a Saturday morning plan. Each day, learn something new – this Saturday is for learning about minute clinics. Big day ahead. This evening is our Learning Showcase, when families come to school to discover all the fun work the children have been doing during second trimester. I know the day is going to pass in a frenzied blur, as has every day this week, as we tie up any remaining loose ends. 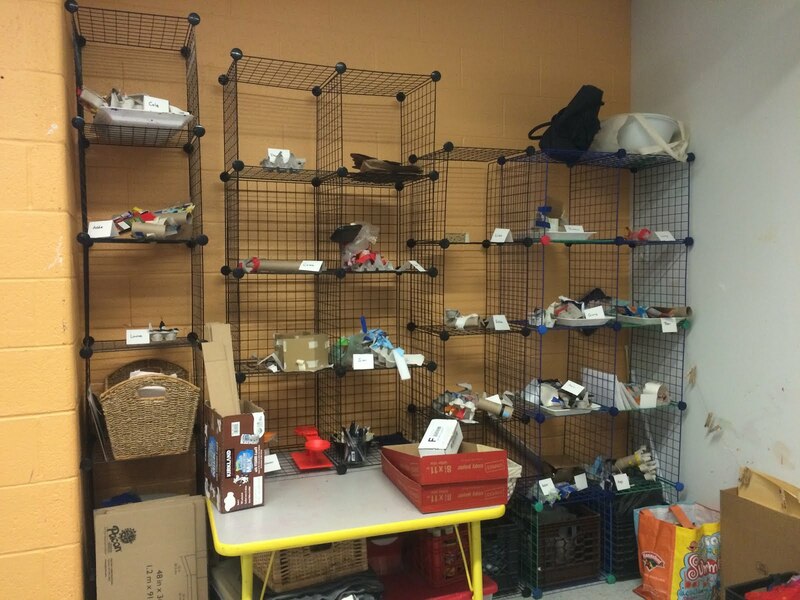 The preschoolers have completed 3-D engineering devices out of recyclables and found objects. I will share these in a blog post one day soon - they are delightful. I love the imaginative stories that accompany each of these creations. We also have individual story books, where children practiced sharing a beginning, middle, and an end - these, too, are so funny. There is a variety of art to see, since we are always experimenting and exploring. Our homemade paper quilt is the highlight. I think disciplining three year olds is a bit of a leap of faith...even after all these years, I am often puzzled by how best to respond. I have a little girl who has been practicing spitting. Not sure why this is a skill she needs, but I'm sure you can predict where it is heading. She sits down on our playground bench with our Teaching Assistant, and has a friendly conversation, when all of a sudden she puckers up and lets go - spitting at TA and hitting her directly in the face (yes, this is the day she finally masters her skill). TA is boiling mad, I mean, who wouldn't be? But there is no room for angry reactions amongst teachers, even teachers who have been spit in the face, so she calmly stammers - That was not okay! You just spit at me! I need a break from you! Well, guess how the preschooler reacts to this reprimand? She jumps up off the bench and bursts into tears, and then grabs two fistfuls of mulch and throws them at the TA. Again, I say to you - what are you supposed to do? How are you supposed to react? Truly, some days, teaching preschoolers requires the patience of a saint. TA walks away in frustration, and I intervene. "Oh my, what is happening?" "Hold my hand, you and I are going to be together now on the playground. We need to talk." I let her calm down, because one cannot have a meaningful conversation with anyone of any age in the midst of a tantrum. She becomes calm when we are back inside, expectant that she will go straight into playing in centers with her classmates. However, I insist, "You need to make amends to TA. Spitting is very, very yucky. You need to find out if she is still hurting. You need to check in on her." "No! she yells back, and the crying resumes. I bring her over to the easel. "I'm going to let you paint a picture for TA. I'm working in the art center, too, so you just hang out here at the easel until you are ready. I'll give you space. This will make a nice 'I'm sorry' gift." One more time she yelled, "No! ", but she was now standing in front of fresh paints at the easel. I just let her be, tried not to look her way, tried to stay busy with other children, but I stayed right nearby. 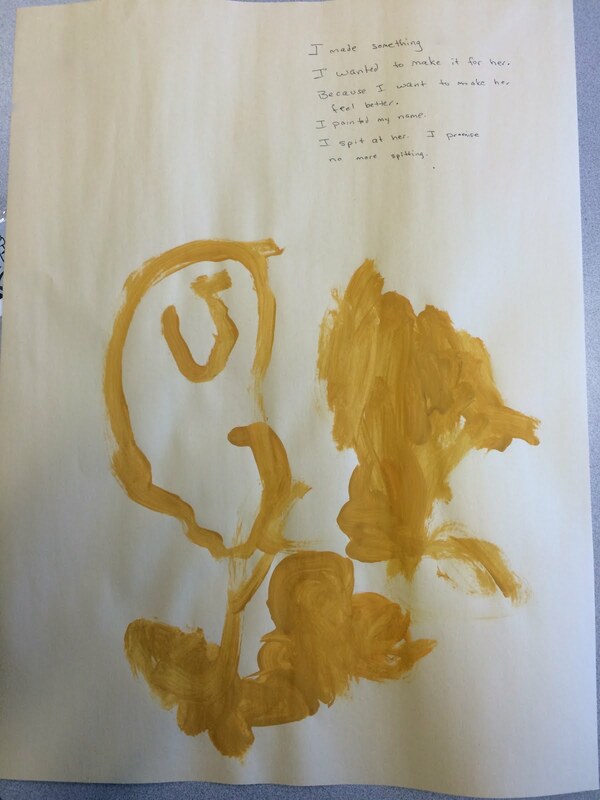 About five minutes later, she called out to me - "Ms. Ingram, I painted a beautiful picture." I walked over to see, and to talk to her a little more. "I like this. I see it is yellow, your favorite color. Tell me about it." She says, "I made something, I wanted to make it for her." I wrote those words on the paper, and continued questioning - "Why did you want to make it for her?" "What made her feel badly?" "I spit." [BINGO! Ownership! What I was after!!] and I continued "I am so glad that you are admitting this. Yes, you did. And now you have painted a picture to make her feel better. Should we tell TA anything else?" then she added, "I promise, no more spitting." I wrote these words on the picture, too. requires so many more moments of reflection and healing. This is the reality of teaching preschoolers, trying to help them see that their actions affect others. It is a work in progress. "May I take the picture home to show my Mom and Dad?" This made me chuckle. Yes, please do, and may they continue the teaching. SOLSC #16 When did I fall in love with three year olds? It was summer 1975 and four Vietnamese refugees came to live with the family across the street from me. There was a tiny grandmother; two sisters, eight and six years old, and a small three year old boy named Khanh. The children of the host family were delighted to run about with these young children and – by extension – we all got to know them, too. At 15 years of age, I was a de facto babysitter for my two younger brothers and all the neighborhood children each time I stepped outside my house. I loved being loved by him. I sang to him, rocked him, read to him. I kissed his sweet cheeks. He loved to stare into my mouth and I would do the same with him – I remember the sad state of his mouth – he had soft, decayed, or non-existent teeth, and sore-looking gums. I think he was fascinated to see my mouthful of strong, healthy teeth. He would give me kisses with his mouth wide open, gumming my forehead or my nose. I would tear him off me, laughing, diverting his attention to a picture book or a run-around game. In the wee, dark hours of one morning, asleep in my bed, I awoke to his small hands on my lips, prying open my mouth, running his fingers around my teeth...and then he climbed into bed next to me... He was so captivated by me that he had left his new home before the sun came up, he had crossed our neighborhood street in the dark, all by himself, he had opened our front door (which we never locked), and climbed up the stairs to my bedroom which I shared with my younger brother, Ralph. I called to Ralph to wake up and get Dad; Dad came in, and shook his head, and said “No, no, little buddy. You can’t do this,” and he scooped him up and carried him back across the street, knocking on their door to let the host family know of this escapade. Both families began locking their doors! The refugees lived a couple more months or so across the street, and then relocated to Northern Virginia. I've often wondered what became of them. Dear Khanh, he snapped me out of my self-absorption, my steadfast focus on grades, getting a boyfriend, anger at my mother, wanting out of the house. He helped me become aware of how big the world was – how many others had so many serious issues to contend with - having no mother at all, being entirely uprooted from all that is familiar, having to learn and comprehend a whole new language, a whole new life, and dealing with people who think less of you because you are so different than them – all serious issues to contend with, and yet they were not sulking. Khanh personified resilience, “can do,” “must do,” determination, the ability to keep on, find ‘better,’ soothe oneself. He made me realize how important an adult’s love and relationship were to a child. Most children stayed in one place, working at one activity. Children had the freedom to move around, freedom to choose a new activity. But, they were very focused and engaged in their play, enjoying what they were exploring, and there was very little movement in the room. Three year old children are all over the place, moving about all day, starting something in one place, doing something else for a bit, returning to the first place, moving on again. No one was playing on the floor. Maybe it was just the day, but the large carpet area where blocks were available remained empty while children chose to do a wide variety of table top activities. In my classroom, it feels as if half the children are on the floor all the time - there are markers, Magna Tiles, and other toys to retrieve, there are roads to be built, there are animal homes to create - three year olds love being on the floor. 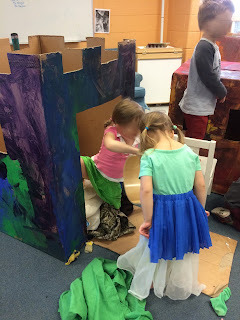 The dramatic play corner, with its dress ups aplenty, featured children getting dressed in one costume, while standing. The floor of the dramatic play area isn't covered with discarded socks and shoes. In the three year old room, children are rolling around on the floor to get clothes on. There is a constant changing of clothes, because new play ideas are imagined over and over. Two children worked at the writing center, writing in their journals, focused on a single page. They were excited to show me the work they had done thus far this school year. There were lots of alphabet letters printed legibly. What a minute? They haven't scribbled on every page of the journal already? Very few three year olds will work at printing alphabet letters, most prefer to draw - and draw on every single page. A teacher called from across the room to a child that was misbehaving, and the child looked up and stopped what he was doing. I'm not sure that the children could hear me over the din in our room! When the children gathered in whole group, they were all sitting pretty still, listening to the teacher. Remarkable! 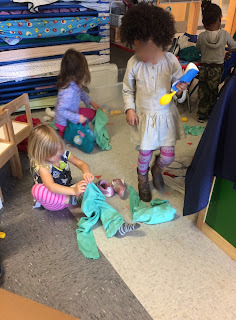 Three year olds have so many wiggles, so many immediate needs that are different from those of the teacher ("Ms. Ingram, my shoe hurts!," "Ms. Ingram, I can't see," "Ms. Ingram, my water spilled.") Most days, whole group is one enormous juggling act. Yes, I was astounded. What a huge difference in children's development in this one year! The Pre-K children showed so much more self-control. With three year old classes being added to elementary schools (as mine is! ), I hope that we remember and respect these developmental differences. SOLSC #14 What happens when we put it all together? stamping found objects with black ink. 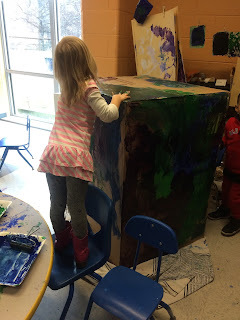 The preschoolers had so much fun with this exploration. I believe they made close to a hundred sheets of homemade paper, and this allowed for many mornings of process art. I stayed at school this afternoon and created a paper quilt of their artwork, featuring one special piece by each child. I think it looks beautiful! I am excited for the families to see this work at our Learning Showcase this Friday evening. I am excited to be participating in Teaching for Change's social justice writing course this school year, Stories from the Classroom. We are a group of fifteen educators in the Washington, DC area and we meet once a month on a Sunday afternoon. I haven't had a writing class since my freshman year of college. 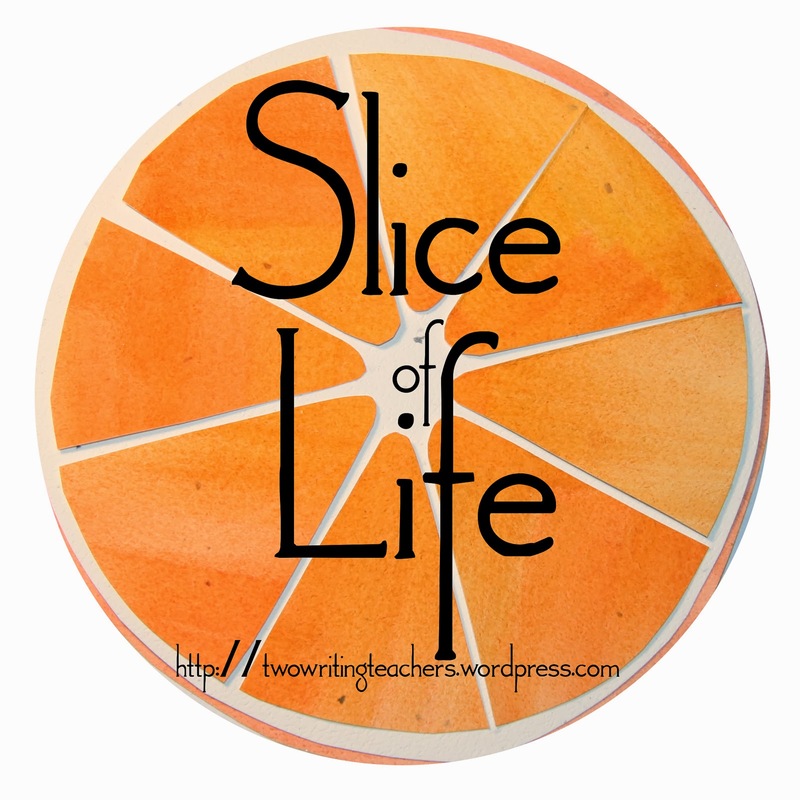 I am now answering journal prompts, brainstorming ideas, collaborating with other teachers about writing, drafting an article, participating in a peer feedback group, getting guidance from published authors, and more. Writing with the lens of social justice is very powerful for me, leading to so much reflection and questioning. Each session has been invigorating - meaning, I find it very difficult to unwind and get ready for the week ahead! But, that I must do - get ready for the week ahead. So, I will keep this short! "Thanks for having me! I love the warm learning environment, and all the wonderful play, magic and love in this classroom." Fridays really are the best day of the week, and yesterday's was above and beyond. 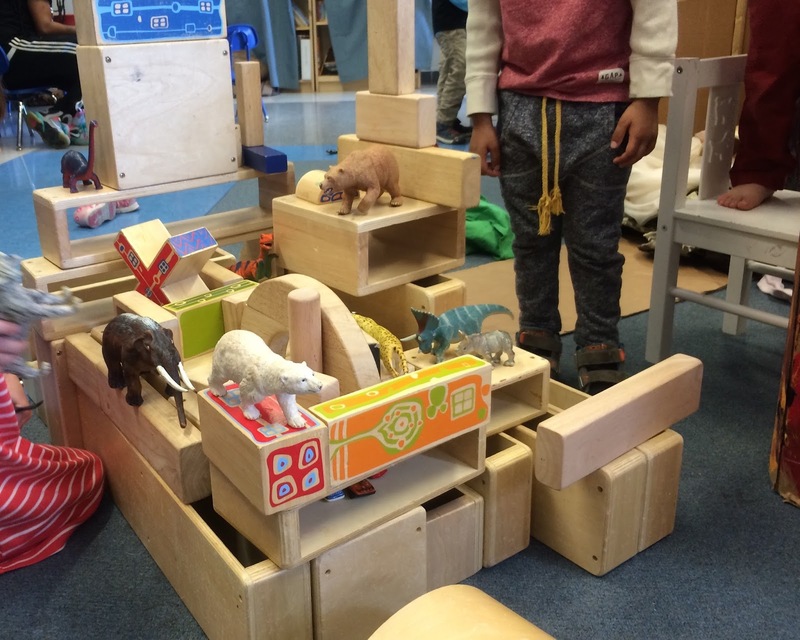 The children's play has been replicating their city lives, and I watched a virtual city arise in our classroom - with some fantastical, magical, fictional details thrown in the mix. We dragged the cardboard castle and house to the carpet where we build with blocks and I suspect this was the catalyst for the city that grew all around it. Magna Tiles and small cars were used on one table, where focused builders created "lines of houses with parking garages" (rowhouses, to my eye) and a batcave (Batman has to be nearby) and a big store for shopping. There was a fervent attempt to make roads, but these would be broken up and changed into new structures. From the table to the floor, there were ramps leading to "a super highway, where the cars go really really fast and crash and go again." 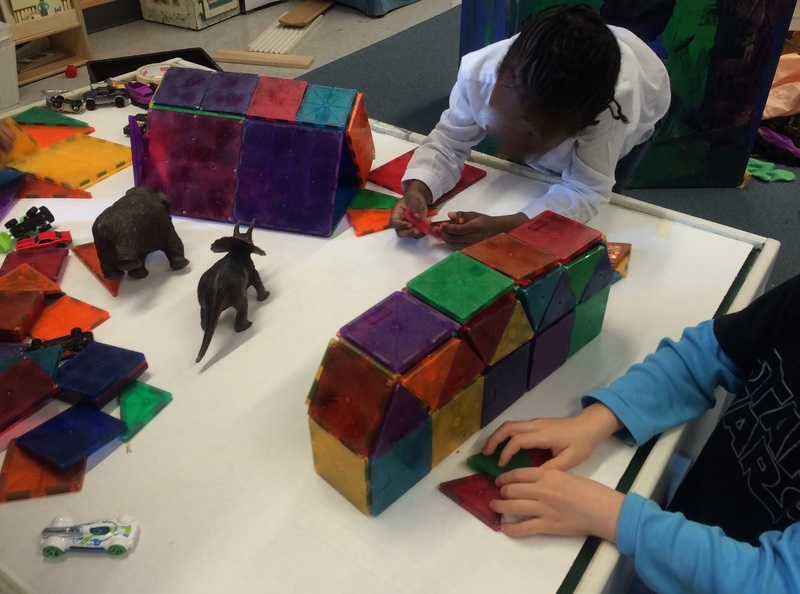 On the carpet, children worked very hard and patiently to create a large, detailed zoo. In the sensory table, they worked with sand and gems and pronounced it "a cake-making place, I mean a bakery!" Over by the large windows, I found two preschoolers lying on cloths, and they explained they were at the beach. The piece de resistance of the city - from my perspective - was the veterinarian hospital. 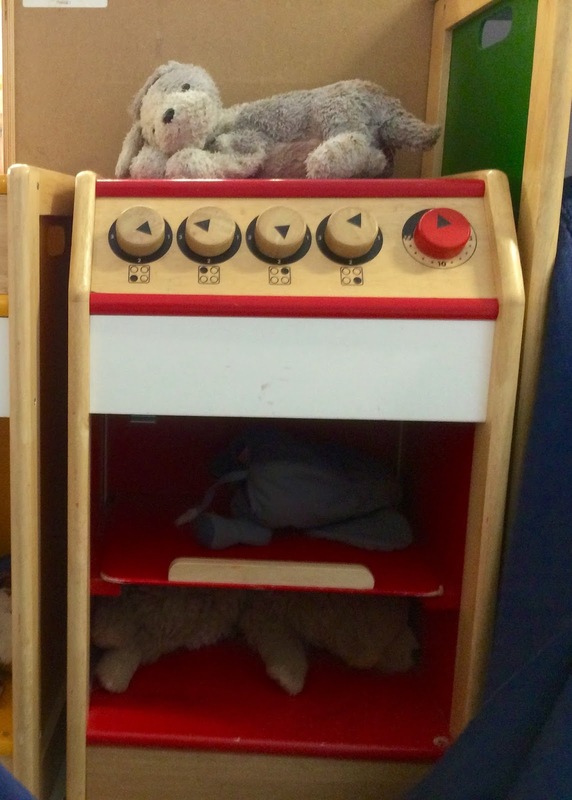 Preschoolers collected all of the stuffed animals in the classroom and created the many beds for the sick animals in the shelving of the dramatic play stove, refrigerator, sink. For some reason, this really made me chuckle. They had toy stethoscopes, medicine, and shots to dispense. Preschool writers were employed to make signs, asking me how to spell 'veterinarian.' (I regret that I did not take a photo of the hospital warning sign they dreamed up, with help from teachers on individual words - "Don't take animal before they fix it") There was a great deal of work. One harried doctor exclaimed, "We're having trouble with the animals, they don't like the medicine." Can you see the animals in this stove hospital? 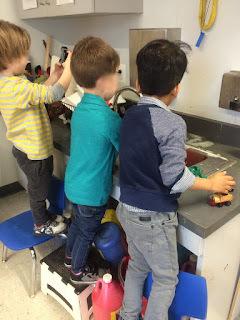 The entire morning was good medicine for me, as I watched preschoolers immersed in play, working so beautifully with one another, showing flexibility, imagination, and joy. 1. Words from a preschooler: "Look, Ms. Ingram, I am growing! My belly is getting so big, just like my Daddy's!" 2. A classmate returns after a long absence and she is enveloped in hugs, children unable to stop loving her, they have missed her so much. 3. Taking a sad child's hand and giving it a quick, gentle kiss, only to have the child say, "Oh, that's the hand I forgot to wash!" 4. Videotaping a child who was talking about his engineering project, forgetting to have the volume on, and being treated to a delightful mime - animated posture, fast-paced words coming from his lips, all accompanied by passionate gestures. Adorable! 5. How quickly tears vanished when I covered the world's tiniest boo boo with a bandaid - out of sight, out of mind. 6. A little boy's delighted squeals on the metro train; his grandmother sharing with me that he loves busses and trains, and so they were spending the day together riding different modes transportation. 8. 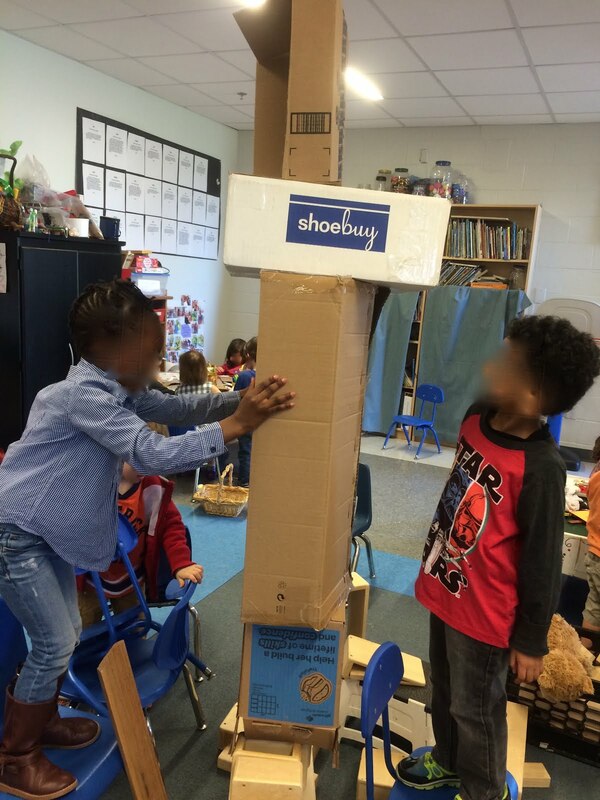 Shrieks of joy from preschoolers as their huge cardboard tower fell down. 9. 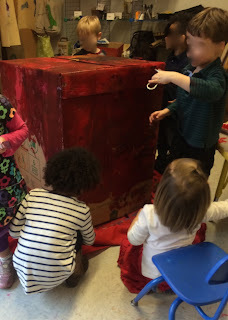 Impromptu puppet shows led by preschoolers at the end of the day. Maybe we can build a tower again today? We continue to work like engineers in the Big Cats. Our latest obsession is towers. How tall a tower could we build? 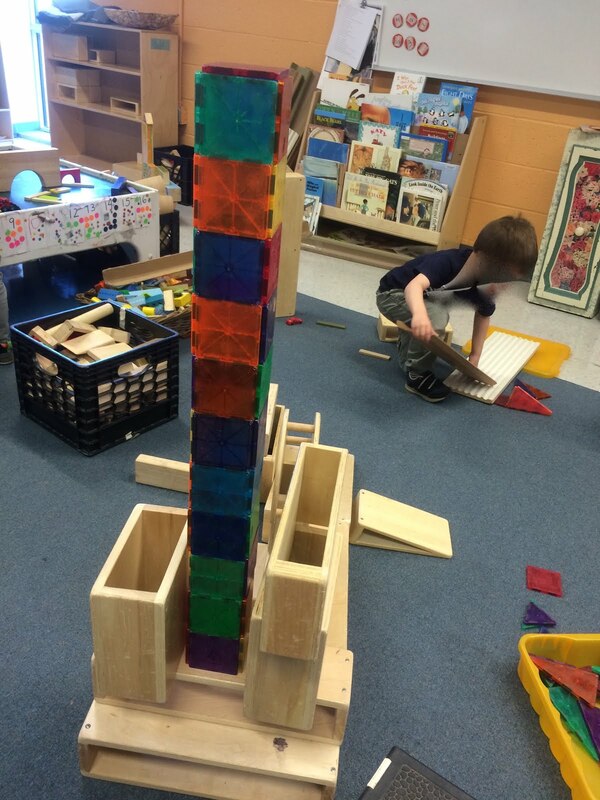 Could we build a tower that reached the ceiling? What height would it be if we did that? Is it taller than Ms. Ingram? We set to work. What should we make it out of? How will we make it stable? Why is it so wobbly? As the children investigated, I was deep in the play with them. I was guiding on the side, ensuring that the space stayed safe as they moved quickly from big wooden blocks to smaller materials, such as Magna Tiles and littler blocks. When the play became a little frenzied, we set new rules. At one point, the children collected many chairs, surrounding the tower to allow them to reach higher up on the tower, and they jumped on chairs quickly, two and three children struggling for the same space. I intervened, stopping the play momentarily, and we talked about how engineers always work in a safe environment, that we needed to ensure workplace safety. 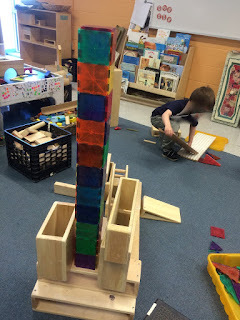 At another point, the Magna Tiles came crashing down and the children went in pursuit of more stuff - again, I reminded them of workplace safety and they cleaned up all the Magna Tile 'debris' before adding in new, heavier blocks. 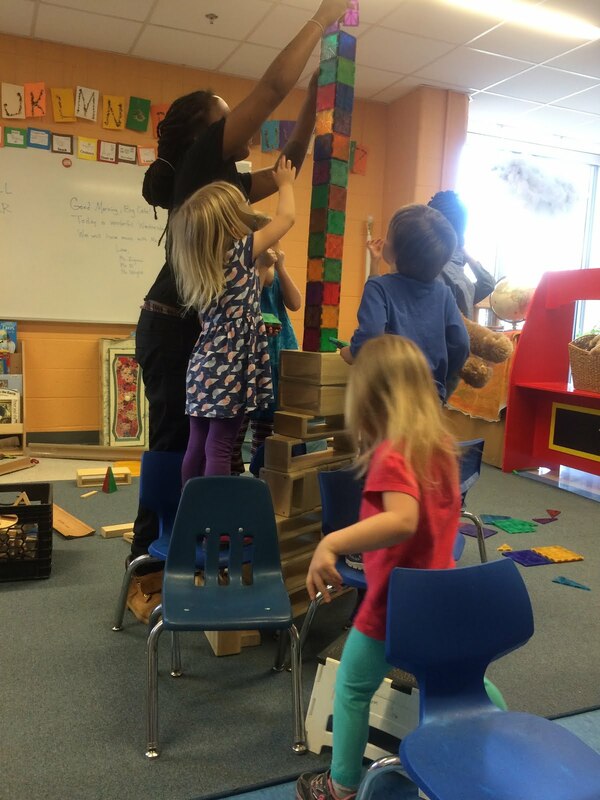 I reminded the preschoolers that engineers move slowly and cautiously, thinking things through. I introduced new words as they worked, for example, helping them see the 'bottom' as the structure's foundation, its base. 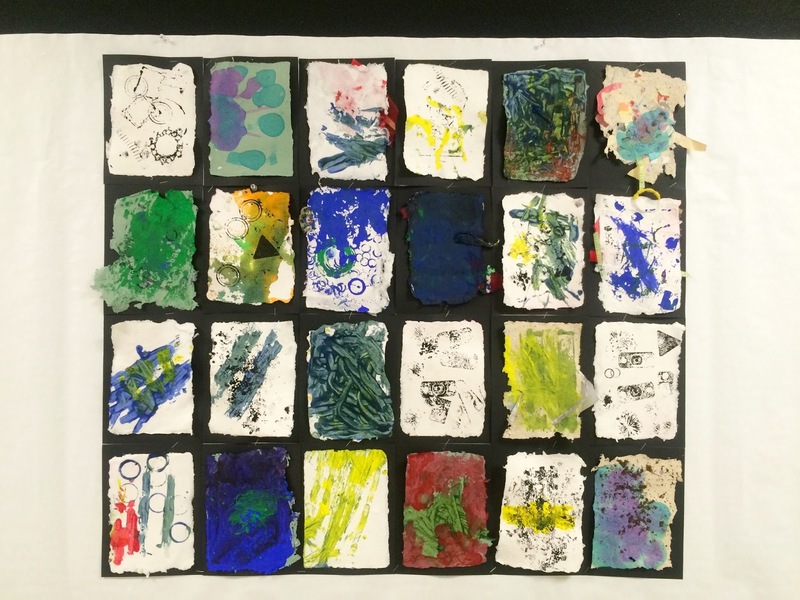 I find that the preschoolers are like sponges with vocabulary, especially when it comes at them in the midst of something they have personally chosen to discover. The only teacher directed rule I imposed was that we could not use wood blocks past the children's shoulder height - they needed to find other lighter building materials after that. I suppose I could have let them discover cause and effect with the wood blocks, but engineers often wear hard hats and we have none. Basically, we just built and built and built. "We couldn't get the Magna Tiles to build"
"It keeps falling, falling falling." "We used wood and sometimes we knocked them and that hurt." "They got too high but not to the ceiling"
"It needs to be stronger." "Maybe if we used bricks, it won't keep falling." Yes, we had a tower of fun! This is going to be an incredibly short slice. May I simply share that I am exhausted? Today, observers from the superintendent's office came to observe each of the four early childhood classrooms - that is, four observers, one for each room. Mine arrived at 8:15, when I was prepping for my day (students arrive at 8:30), and she left a little after 12 noon. What other profession experiences this? Capturing a person's every word? Seeing what is noticed? what is missed? How did this become a norm for a classroom teacher? A family donated two appliance boxes and we turned them into a castle and a house. The children delighted in painting these, using rollers and brushes. Now, they adorn our dramatic play corner and the preschoolers play here all morning long. 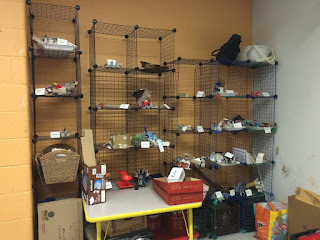 I am fascinated by all the stuff the children drag into the boxes to add to their play - found objects, acorns, magnifying glasses, goggles, blocks, Magna Tiles, doll babies, markers. There's also something that simply must be removed when they play here: their socks and shoes. Why do they drag so many things in? Why do they remove their socks and shoes? Why do they have so much fun inside these two boxes? All I know is, it is so. Some are taking shoes off. I am taking shoes off. Come, I am in here! No, I'm not the dragon! Hey, I'm in here, too. You must be quiet from the dragon. I need to get a blanket and tie it.